Irish shoe laces feature green shamrocks and they would complement our selection of shamrock socks. Sorry, the shamrock shoe laces are sold out. 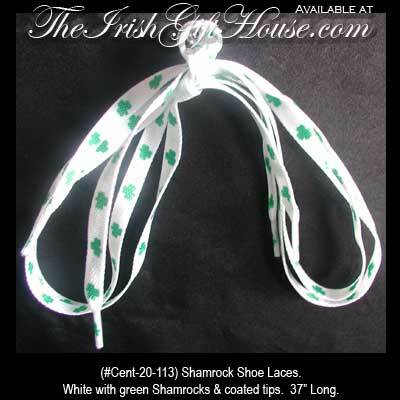 These shamrock shoe laces are white with repeated printed green design and measure 37" long including the coated tips. The Irish shoe laces with shamrocks are both decorative and functional and would look great on many types of shoes. The laces are received with a shamrock history card, complements of The Irish Gift House. Shamrock ankle socks feature green glitter for extra sparkle.